May is . . . . National Salad Month, National Egg Month, National Barbecue Month, National Hamburger Month, and Fungal Infection Awareness Month in the U.S.
May 1 is May Day, the international working class holiday, in honor of workers' rights.It is celebrated all over the world today. Mayday originated as a pagan holiday celebrating the spring planting. The festival of the Roman goddess of spring, Flora, was celebrated from Apr. 28 to May 3. The Celts celebrated it as Beltane or Fire Day in honor of the god of the sun. In England the celebrations began on eve of May, April 30. It was a popular holiday filled with revels. Putting a maypole up involved taking a growing tree from the wood, and bringing it to the village to mark the change of season. It was once a period of great sexual licence. People would go off into the woods to collect their trees and green boughs, and while there, well, you know.... 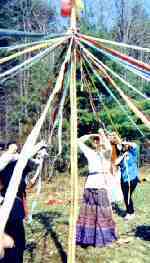 Dancing around the May Pole was a more wholesome tradition. The Catholic Church tried to ban it. The Puritans tried an act of Parliament, but people continued to celebrateit. Eventually the rough edges of May Day were smoothed. In 1899 the Second International declared May 1 a worker's day in honor of the fight for the 8 hour working day. Today it is still celebrated as an international labor day. When all the flow'rs were fresh and gay.